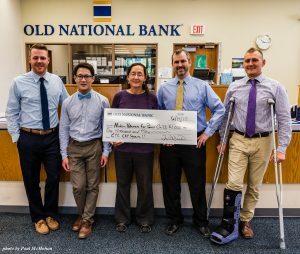 On Wednesday, June 14 Chapter 25 VFP was presented with a $1,000.00 check from Old National Bank in Madison, WI. The check was awarded as part of their “Vote for Your Favorite Charity” program. Congratulations Chapter 25 members! For a little over a month you got online every day and placed your vote for peace. Pictured is Chapter Coordinator Fran Wiedenhoeft. Photo by Chapter Treasurer Paul McMahon. This entry was posted in Clarence Kailin Chapter 25 and tagged $1000, National Bank, Vote For Your Favorite Charity on July 4, 2017 by Website Administrator.